Better news: Here's a guide to doing just that, section by section. (Or, click here to jump straight to the template.) Looking to hire a different role on your sales team? Check out The Ultimate Guide to Sales Hiring here. A more interesting -- and often more comprehensive -- way to do this beyond the typical bulleted list? Describe a “week in the life of” your sales manager. 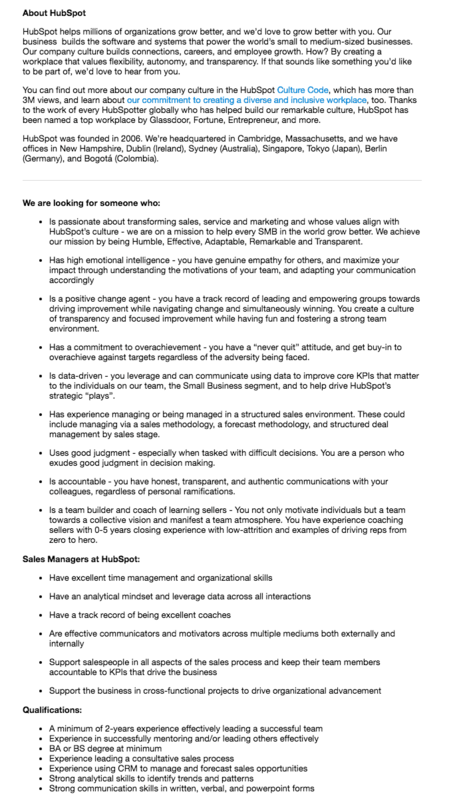 Here's an example of a real sales manager job description at HubSpot. Great sales managers check the majority -- if not all -- of these boxes. Analytical: Sales managers need to review data, see what's relevant, draw meaningful conclusions, and find actionable takeaways. Thoughtful and strategic: Once they've gathered the evidence, they need to identify next steps. Most decisions involve making tradeoffs. Collaborative: They should be good at working with others -- from their fellow managers to other department leaders. Inspired and enthusiastic: To keep their reps on-track and motivated, sales managers demonstrate genuine passion for their team's mission. Hiring sales managers is an art -- and almost as important as making your first sales hire. Source a great one, and you'll be well on your way to building a high-performing sales team. Want tips on hiring great SDRs, too? Check out this piece on how top sales leaders are interviewing SDRs in 2018.